Joseph M. Juran is considered by many to be the greatest quality thinker of the last century. His humble beginnings as an impoverished immigrant fueled his drive for quality and led to countless accolades, honors and medals. He began his career at Bell System's Western Electric in the early 1920s and developed statistical tools still widely used today. While at Western Electric, he worked with other quality luminaries such as W. Edwards Deming and Walter Shewhart. During World War II, Juran served as an assistant administrator for the Lend Lease Administration. But following the War, he decided that big bureaucracies weren't for him. Instead, he became a freelance management consultant. He spent much of his time lecturing, researching, writing and consulting about quality. He also made numerous trips to Japan to help rebuild its shattered economy. In the years that followed, Juran wrote numerous books, including Juran's Quality Handbook, commonly considered to be the international quality reference book, now in its fifth edition. He also founded the Juran Institute and the Juran Foundation (now the Juran Center at the University of Minnesota) and was instrumental in starting the Malcolm Baldrige National Quality Award. Although Juran retired from public life in 1993, he still occasionally speaks, writes and is hard at work on his memoirs. In June, I interviewed Juran at his home in Rye, New York. Despite his 97 years, he's still physically strong and mentally sharp. Although sometimes careful with his answers, he didn't fail to speak his mind. As with the previous interviews I've conducted with him, Juran was polite, considerate and humorous. QD: What do you think has been the greatest achievement in the quality world during your lifetime? Juran: That's easy: the Japanese quality revolution. Remember, Japan set out to get a place in the sun by military means. Obviously, that didn't work, so they set out to do it by peaceful means, through trade. As they undertook to do that, they found that trade requires you to import materials, fashion them into goods and sell those goods. It's like the British did a couple of centuries ago, becoming the most important power on Earth. However, the Japanese had a big handicap: The stuff they had been exporting prior to World War II was pretty shoddy. Although they had low prices because their wages were very low, they had about the worst quality reputation in the world. When you can't sell your stuff and the reason is poor quality, that message goes all the way to the top. They undertook to improve their quality and improve their reputation. It took a long time, about 30 years or more, but they were successful. Not only could they sell their stuff and get a large market share; it brought them to the status of economic superpower. QD: How did the Japanese bring about this quality revolution? Juran: They did a whole series of things. The top people took charge of quality, which was pretty unusual. They undertook to train the entire hierarchy in how to manage quality, which requires a lot of training. They opened up the business plan to include goals for quality, which was unprecedented. One of those goals was to get quality improvement every year, year after year, at a revolutionary pace. The rest of the world was improving quality at an evolutionary pace. These lines crossed, in my estimate, somewhere around 1970. They then went beyond the revolutionary approach to improvement. They did something else that nobody in the West has managed to do: They made it possible for the workforce to participate in improvement through something called "QC Circles." QD: After decades of improvement, why is the quality of U.S. products and services below that of the Japanese? Juran: With relatively few exceptions, the United States is still below the Japanese as far as quality is concerned. In fact, that's true for the West, generally. Why? We have a lot of know-how about how to achieve high quality. We even have a few role-model companies that did the same thing in pretty much the same way. The approach is common for all the successful companies. We have a strange situation: We know how to do it, but our companies don't do it. Here are some of my theories why they don't: A lot of companies have tried to improve quality, and it didn't work. They listened to consultants and spent a lot of time trying things out. Most of the time was spent learning what not to do, what doesn't work. So a lot of companies gave up. Bear in mind, mediocre quality is still saleable. People want the services that new products bring. They buy them and take the chance that they are not going to get a lemon. A lot of companies think that their businesses are different. They are different; they have different technology, different markets, different culture and so on. But I found when I got into consulting many years ago that every one of those different companies had common quality problems. To diagnose those problems, I used certain diagnostic tools. To find remedies, I used certain remedial tools. To hold the gains, I used certain common control tools. I was going through the same sequence of events in company after company, even though they were certainly different. So there is a body of know-how there that is common and heading toward a science of managing for quality. A lot of companies believe that getting certified to ISO 9001 solves their quality problems. That simply is not true. ISO 9001 has some value in trying to minimize the number of assessments that are made. But the ISO 9000 series was pitched at a mediocre level. The various ingredients that the Japanese did differently are not a part of ISO 9000. We've been taken in by the standardization people coming up with a standard that's not at the excellence level but at the mediocre level. That's inherent in the way standards are set. There has to be a consensus. The different members from companies of different standardization bodies are not going to agree to standards that their companies are not able to meet. They are starting to change the standards, but that's at a glacial pace. It takes a long time to change an international standard. Some people think that higher quality costs more. That confusion exists in many different companies. The word "quality" has two very different meanings: One meaning is the features of the product that enable it to sell. There, higher quality generally costs more. It takes more product research, more product development and so on. People don't even call it a cost; they call it an investment, which will bring back higher returns. That's quality on the marketing side or the income side. Quality on the cost side is quite different. The cost of failure, the internal failures--scrap, rework, slow deliveries, failure to deliver on time--and the external failures--field failures, lawsuits, safety problems. A lot of CEOs believe that they are too busy to lead the quality charge, and so they delegate it. That hasn't worked very well. Leadership by the top people is an essential ingredient in getting out of that steep slope. QD: You talked about ISO 9000. Are you surprised by its success and widespread acceptance? Juran: I was astonished that it took off like it did. I am still surprised. I must say that there are indications that the people who are paying for those assessments are getting fed up. I remember in my astonishment I used to ask companies: "What are you going into this for? What you're doing is already much stricter than the criteria that are set out in ISO 9000." The answer was: "We know that. But we don't think, from a marketing standpoint, that we can be in a position where our competitor is certified and we are not. We'd be at a marketing disadvantage." There was a stampede that started out with Admiral D.G. Spickernell, the head of the British Standards Institution. He persuaded the British military to use the defense standard in assessing defense contractors. The standards organization urged the standard on civilian buyers. It was all voluntary; there was no compulsion to be certified. That began to take hold and be strongly propagandized by the standards organization. And then, little by little, whoever got themselves certified advertised the fact that they were certified. The public didn't realize that they were being certified to a mediocre standard. The idea that the standard was pitched at a mediocre level has never been properly brought out. QD: Do you think that ISO 9000 has actually hindered the quality movement? Juran: Of course it has. Instead of going after improvement at a revolutionary rate, people were stampeded into going after ISO 9000, and they locked themselves into a mediocre standard. A lot of damage was, and is, being done. QD: What do you think of Six Sigma? Juran: From what I've seen of it, it's a basic version of quality improvement. There is nothing new there. It includes what we used to call facilitators. They've adopted more flamboyant terms, like belts with different colors. I think that concept has merit to set apart, to create specialists who can be very helpful. Again, that's not a new idea. The American Society for Quality long ago established certificates, such as for reliability engineers. Right now there are more than 100,000 certificates issued by ASQ. Most people don't even understand what Six Sigma means. It is a goal. A goal of very few defects, down to defects per million. We used to think in terms of percent defective. For example, 1 percent defective is 10,000 defects per million units, a far cry from three or four. Basically, the concept is perfectly good, but there is nothing new. It originally started with Bob Galvin, the former CEO of Motorola and a very ardent pursuer of excellence in quality. Some years ago, he gave his organization the job of improving quality and reducing the defect level by an order of magnitude. Now, to reduce it from a few percent defective to three per million, that's four orders of magnitude. The name Six Sigma comes from a measure of what we call process capability, measuring the inherent uniformity of the process. One of the things that is inherent in tools used to achieve improvement under the label of Six Sigma is the concept of process capability. Now, to my knowledge, that concept of process capability goes back to 1926, when I was a young engineer at Western Electric. I got into a problem, and I ended up discovering that every process can be quantified in terms of its inherent uniformity. That can be compared with the tolerance limits to see whether the process is up to doing the job. In addition, you can also see whether the process is capable but is being misdirected. I am the inventor, if not the reinventor, of that concept. QD: There is a lot of marketing hype around Six Sigma, just as there was with ISO 9000. How do you feel about that? 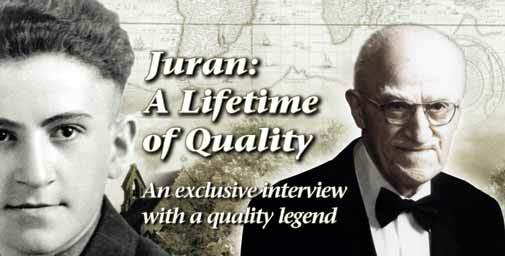 Juran: I am in favor of improving quality by whatever means. Right now, I think that what has really caused the spread of Six Sigma is GE. They went into quality improvement, urged, I think, by what Bob Galvin had done at Motorola. Jack Welch personally went into this. Then he went public with the results to huge acclaim and huge savings running into the billions of dollars. That got a lot of press and was pretty hard to ignore. I don't like the hype, and I don't think the hype is going to last. Something that is as successful as the improvement process gets label after label after label. Those labels come and go, but the basic concept stays. There will be some marketer that finds a new label, finds a way to make that a fad and off he'll go, doing the same thing we did before under a new label. QD: You were very involved with he development of statistical methodology in quality. Can you tell us about the development of statistics in quality? Juran: The use of statistical methods in quality dates back to 1903, when the Bell System faced a problem designing its central offices. A subscriber takes the phone off the hook and gets a dial tone. That means he's connected to a line that goes to the central office. The question was, "How many of those lines do you need?" Theoretically, every single subscriber could take his or her instrument and start to use it, so you'd need a line for every subscriber. Actually, subscribers don't do any such thing. Only a few percent at one time are using it. So you need on average only a few percent as many lines as you have subscribers. Now, the question was, "Are we willing to operate at the average?" No, there'd be too many cases of a subscriber not getting a dial tone. So how many lines should you provide? That took statistical analysis. They took data: What's the rate of busyness day by day, hour by hour? Based on that, they identified when the traffic was busiest, how many lines that required, and that enabled them to make a managerial judgment as to how many trunk lines to provide. That was the earliest application of statistics in the Bell System. Bell Labs thought that these tools might have application in the factory. In 1926 a delegation from the Bell Labs came to Western Electric's Hawthorne factory, where I was employed as a young engineer. They met with the chief inspector and some of his people. They formed a joint committee on inspection, statistics and economy, and they agreed to meet a couple of times per year. The head guys in Western Electric soon discovered that nobody in the place knew anything about statistics, so they brought in a professor from the University of Chicago to give a course. About 20 managers and engineers attended that course, and I was one of those engineers. Then to help the committee in dealing with the statistics, they set up a little department with a boss and two engineers called the inspection statistical department. I was one of those engineers. As the committee met and got into scientific sampling, they soon discovered the control chart, which was an invention of one of the Bell Labs' mathematicians, Walter Shewhart. Although he was a brilliant mathematician, he had a limitation: His knowledge of the factory was nil. He was a very poor communicator as far as lay people were concerned. He needed an interpreter, so I was asked to pilot him around the factory. I had the job of selling some of this stuff to the inspection supervisors, but I very seldom made a sale. They had empirical ways and they stuck to them. So there was almost a state of dormancy there until World War II. At that time, the War Production Board, whose job was to harness the civilian economy to the military machine, set up a department to help improve quality in the military. As luck would have it, they appointed two professors to head that department. They concluded that in order to improve quality, we should teach the factories statistics. Eugene Grant of Stanford University went around the country giving these courses for free. A lot of companies sent their young engineers. Now, these courses didn't affect who won the War, but they had a tremendous effect on the people who attended those courses. They were meeting people from other companies for the first time in their lives. It was wonderful to be able to exchange information. They formed a bunch of quality societies in different cities around the country. Those finally became the ASQ. They created a journal that at the outset contained nothing but statistics. It took a long time for the idea that managing for quality is the important thing, and statistics is a part of that. They resisted that. To them, statistics was everything. Ed Deming went to his grave believing statistics is everything. If you make use of statistics, everything gets resolved. Of course, he never managed anything. He didn't know about managing. QD: Obviously, you've achieved tremendous success in your lifetime. To what do you attribute that success and your drive for achievement? Juran: I'm surprised that it happened. I've kept a pretty low profile. I keep the publicity people at the Juran Institute on a pretty short leash. I don't like flamboyant statements about myself. I started out like any other recruit in a big company. I was recruited out of engineering school, I did some useful things for my bosses and I got promoted. That was a mistake. They took a pretty good analyst and made a lousy manager out of him. At the end, I found that my weaknesses in human relations had caught up with me, and I was finished. I knew I wasn't going to go any higher in the organization. When World War II came along, I was appointed the assistant lend lease administrator for the Foreign Economic Administration. At the end of the War, I had to figure out what I was going to do. I realized I had gotten to be kind of a misfit in these big bureaucracies, and I opted to become a freelance consultant. I wanted to be more than a consultant: research, consult, philosophize, write, lecture, the works. Of course, there wasn't any ready-made job like that. I had to piece one together, and it worked out wonderfully. I also had an urge to write. It was an itch I had for a long time. So I wrote a great deal. Every month I wrote articles for the journals of the ASQ, the American Management Association and others. Those were read by a lot of people. Also, while I contemplated making that change, I had in mind preparing a comprehensive work on the subject, which came to be known as the Quality Control Handbook, which is now in its fifth edition. That brought me to the attention of a lot of people in the field. So one thing seemed to follow another. In fact, at the time I became a freelance individual, I didn't want any kind of organization. I didn't want to be a boss, and I didn't want to be a subordinate. Things seemed to grow naturally. All of those medals and honors were just byproducts of that. QD: Which of your achievements are you the most proud of? Juran: I'd be pretty hard put to answer that. I am not even sure that I am proud. I am an immigrant, and I came from a pretty impoverished family. I lived in a neighborhood where everyone else was poor. Your outlook is very different when you start out that way. My goal in going into higher education was just getting away from all of that. I discovered in all the different jobs I held in those days that the employers favored someone who was going for an education. It seemed to be the passkey to getting out of poverty. You learn some pretty useful habits if you have to live in those circumstances. You're not afraid of long hours or hard work. QD: What advice would you give to someone just starting out in quality today? Juran: I would start out by saying, "Are you lucky!" Because I think the best is yet to be. In this current century, we are going to see a lot of growth in quality because the scope has expanded so much. We used to think that it was a factory problem. No more. It has expanded from the factory to the offices to the warehouses and away from manufacturing to all the other industries, including the giants: health care, education and government. Scott M. Paton is Quality Digest's editor in chief. Letters to the editor regarding this piece can be e-mailed to letters@qualitydigest.com.